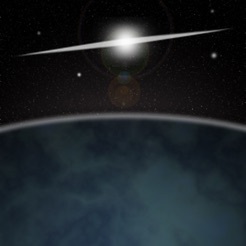 Iridium flares are phenomenon caused by the polished antennas of the Iridium communication satellites reflecting sunlight onto the Earth below and appearing as a brief, bright "flare". 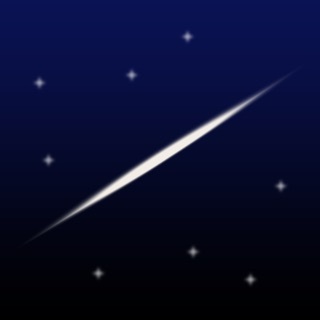 iFlares calculates the occurrences of Iridium satellite flares for your current position (or any other location on earth). iFlares provides a navigation mode, using the devices accelerometer and compass (if present) to give you visual directions where to look for a flare. The flares are calculated directly on the device, i.e. you don't need an Internet connection in order to check for upcoming flares! 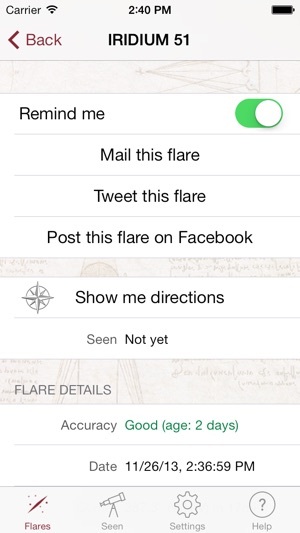 iFlares let you set reminders for flares, mail information on upcoming flares to your friends or even post them on Twitter or Facebook. 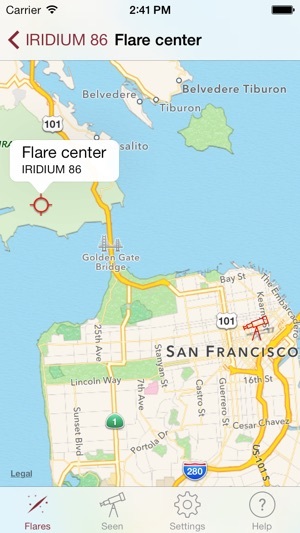 iFlares keeps record of seen Iridium satellites on the device and synchronizes this information with Apple's Game Center. 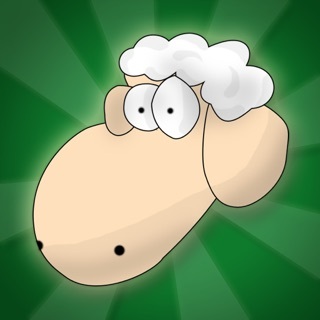 That way your Iridium flares achievements are not only automatically synchronized between your different devices, you also can compare them with your Game Center friends. 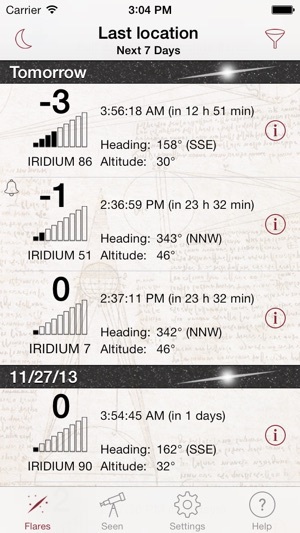 - Keeps record of all seen Iridium flares and automatically synchronizes the achievements to Game Center. 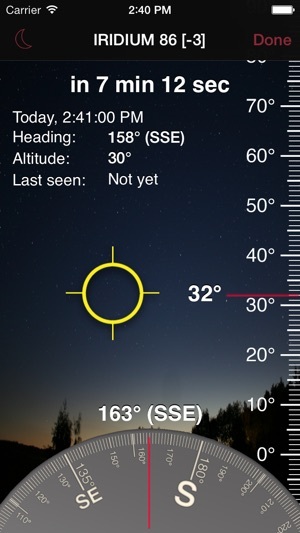 I buy every app of this type, SkySafari Pro, Sky Guide, everyone that makes it to the App Store. Amateur Astronomer with a passion for Wide Field Astrophotography. Initially I gave it a quick once over and said... meh, not so great. Got a notification from Loss of the Night, hey good time to participate. So while outside. I gave this another look. I don’t recall an update, but this is now Awesome. It has nice details of each Iridium satellite, such as stability or unstable (a gamble if it will be where they suspect and flare). It tracks the satellites I’ve seen. 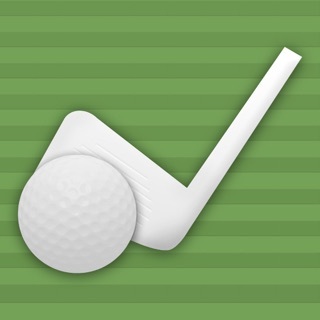 It sets reliable reminders, and I set the when, from one minute to sixty minutes. It has an audible countdown timer. It has a nice guidance reticle. It has plenty of options to set your minimum magnitude, types, etc. It allows storing of multiple locations. 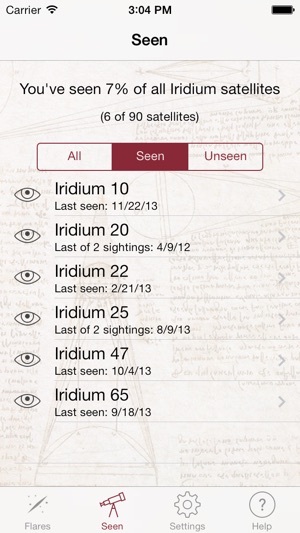 If you try to spot the Iridium satellites when they flare, you will want this app! This app used to work five stars. 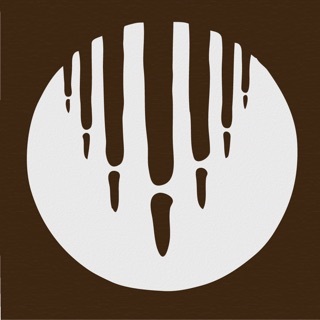 But about several months ago it seems that the data was not updated automatically, and was degraded greatly. When I compared this apps results with another that I now use, I find that this app comes nowhere near being accurate for any forecasted flares. Very disappointing. Don't bother to download until this is fixed. 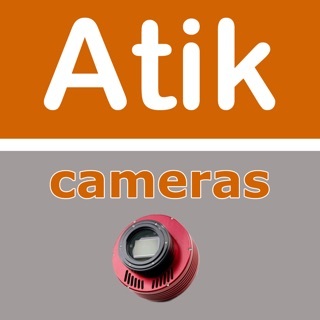 This app is a pleasure to play with. I've now seen about 43% of all sats... and I *really* appreciate how it leverages Game Center to keep track of those across my iOS devices.